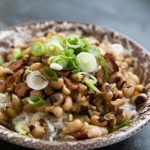 This Hoppin John dish is a must in the South for the New Years Holiday. This is a traditional dish and is supposed to bring you good luck for the rest of the year. Here's wishing you lots of luck! Note: You can change the number of people served by placing your cursor over "Servings". The Ingredients will adjust to the new number of servings. 8 Oz. Dried black-eyed peas. Simmer gently, uncovered, just until tender, 20 to 30 minutes. Drain, reserving the cooking liquid. Discard the bay leaves. Season the peas and ham with the salt and pepper to taste. Cover and set aside. Let the pea cooking liquid settle for about 5 minutes, then pour it into a 4-cup measure, discarding the residue at the bottom of the pot. Add the chicken stock to make 2 3/4 cups. Position a rack in the center of the oven and pre-heat the oven to 325 degrees. Set the same pot you used to cook the peas over medium heat and add the butter and bacon. Cook, stirring, until the bacon has released most of its fat and has begun to crisp. Stir in the rice and salt, cook, stirring to coat the grains with fat for 1 minute. Add the pea cooking liquid and bring to a simmer. Stir once with a fork, then cover and bake until the rice has absorbed all the liquid, 20 to 25 minutes. Scatter the peas and the ham over the top, cover and return to the oven for 3 minutes. Sprinkle with the fresh parsley. Toss lightly with a fork until the rice is fluffed and all the ingredients are mixed. Cover and let stand for 10 to 30 minutes before serving. Hoppin John can be made 1 day ahead, covered and refrigerated. Bring to room temperature, then bake, covered and without stirring, in a 275 degree oven just until warmed through.